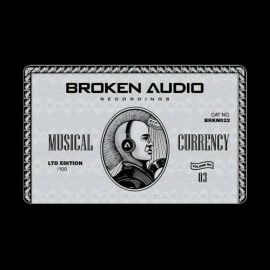 Musical Currency Volume 3 Out Now! As the bleak winter weather pervades our very souls, we aim to warm things up with ‘Musical Currency – Volume 3’, the latest selection of killer cuts brought together in our own unique credit card compilation format and limited to just 100 copies. Last time out we delivered Volume 2, a selection of cuts that focused on the uplifting. This time for Volume 3 the mantra is one of being uncompromising; taking things back to the raw breaks & gut wrenching bass upon which our very own label foundations were built. We make no apologies, this card will take you down deeper than a pay day loan, a high rate of interest is guaranteed!